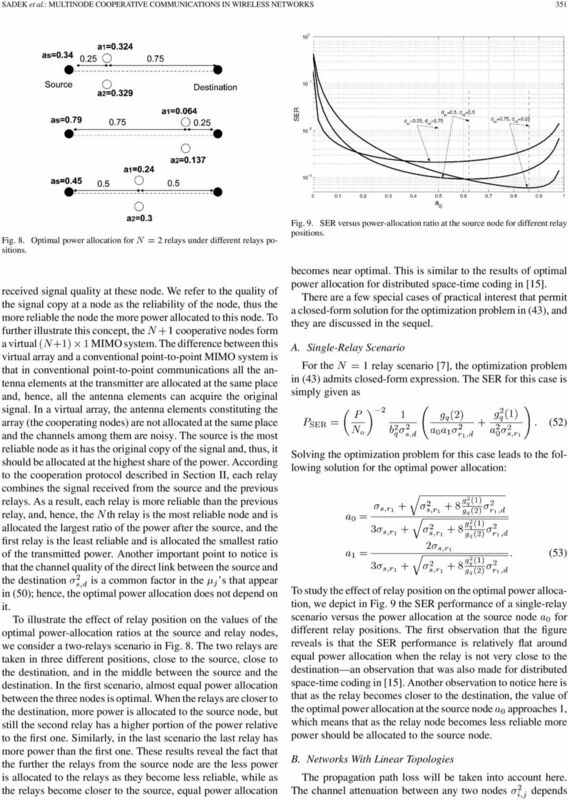 Download "IEEE TRANSACTIONS ON SIGNAL PROCESSING, VOL. 55, NO. 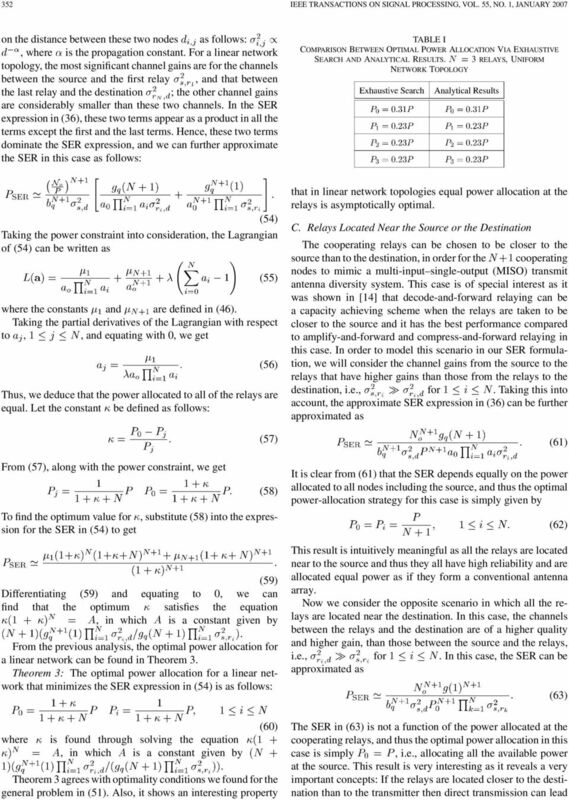 1, JANUARY 2007 341"
8 348 IEEE TRANSACTIONS ON SIGNAL PROCESSING, VOL. 55, NO. 1, JANUARY 2007 Thus, only the states determined from the previous conditions will contribute to the SER expression at high SNR because they decay as SNR, which is the slowest decaying rate as seen from (31). From (30) and (32) (34), the conditional SER for any of these states, e.g.,, can be determined as follows: SER (35) Summing (35) over the states in (33), we can further determine the approximate expression for the SER in Theorem 2. 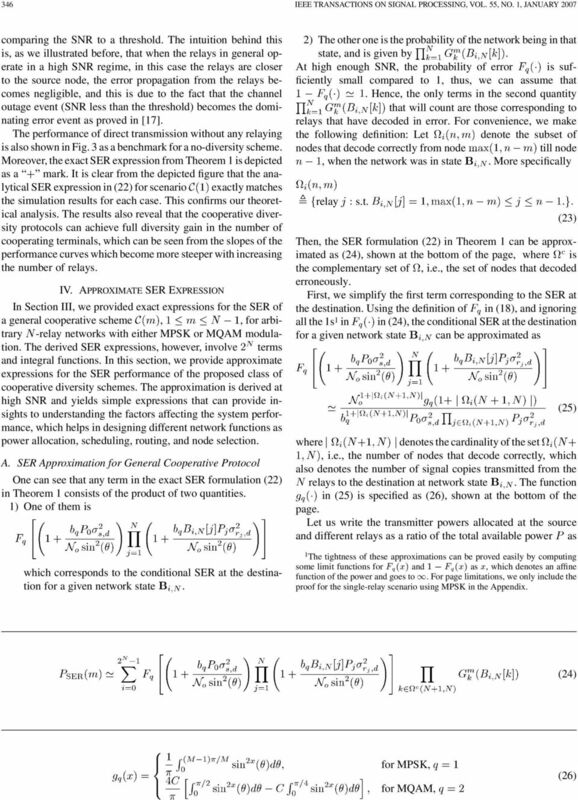 Theorem 2: At high enough SNR, the SER of an -relay decode-and-forward cooperative diversity network employing cooperation scheme and utilizing MPSK or MQAM modulation can be approximated by (36) A very important point to be noticed from Theorem 2 is that the approximate SER expression in (36) does not depend on, the class parameter. 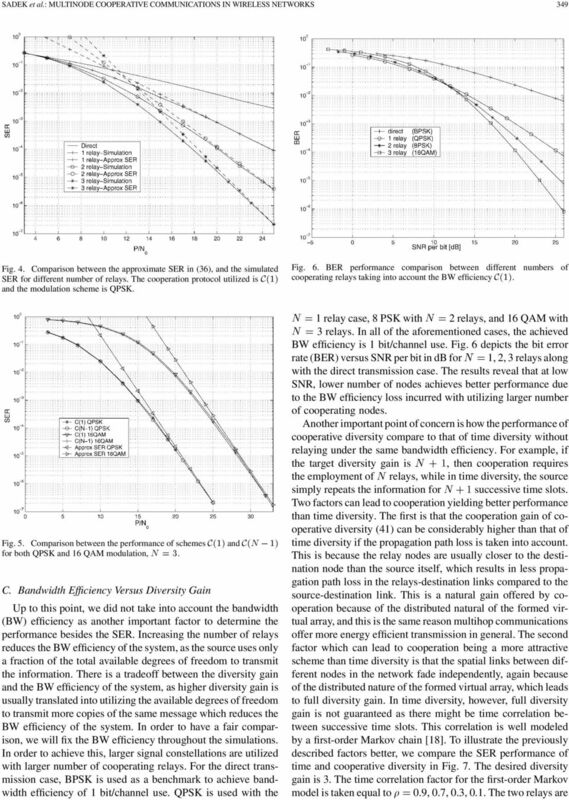 Hence, the whole class of cooperative diversity protocols shares the same asymptotic performance at high enough SNR. 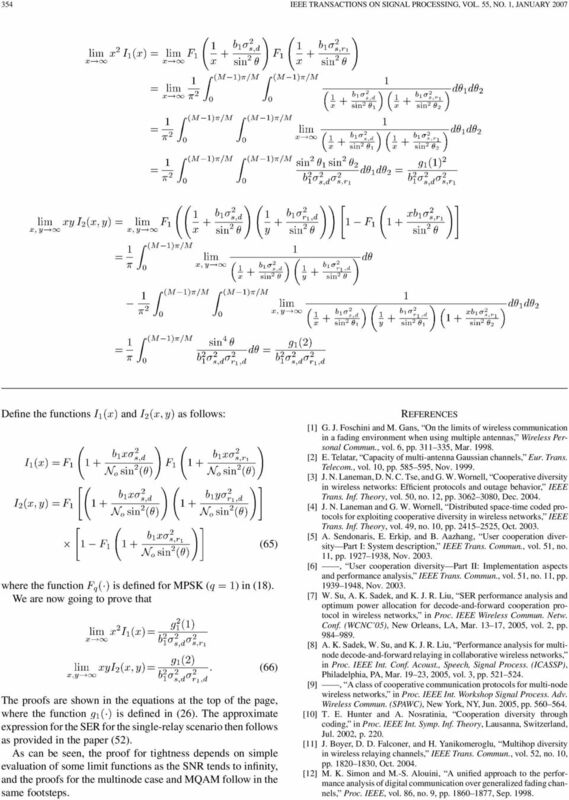 The results obtained in Theorem 2 illustrate that utilizing the simplest scheme, namely, scenario, results in the same asymptotic SER performance as the most sophisticated scheme, namely,. This motivates us to utilize scenario as a cooperative protocol for multinode wireless networks employing decode-and-forward relaying. The simplicity behind scenario is due to the fact that it does not require each relay to estimate the CSI for all the previous relays as in scenario. It only requires each relay to know the CSI to the previous relay and the destination thus saving a lot in the channel-estimation computations. In the following, we determine roughly the savings in the computations needed for channel estimation when using scenario as opposed to scenario by computing the number of channels needed to be estimated in each case. The number of channels needed to be estimated in scenario is given by (37) where is the number of relays forwarding for the source. This value accounts for the channels estimated at the destination and channels estimated by the relays; the first relay estimates only one channel. In scenario, the th relay estimates channels, and thus the amount of computations for this case is given by (38) From (37) and (38), the savings in the computations needed for channel estimation when using scenario as opposed to scenario are given by (39) The previous ratio approaches 0 in the limit as tends to. Hence, utilizing scenario will reduce the protocol complexity while having the same asymptotic performance as the best possible scenario. 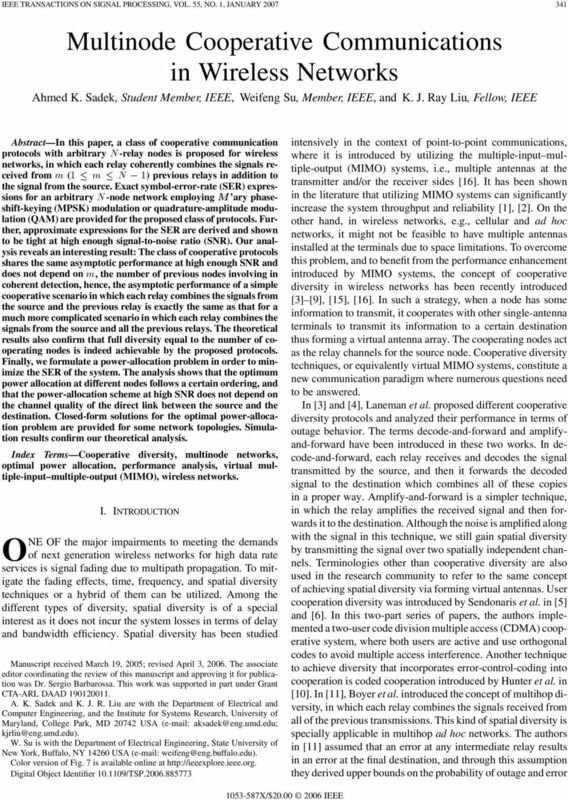 B. Diversity Order and Cooperation Gain The philosophy before employing cooperative diversity techniques in wireless networks is to form virtual MIMO systems from separated single-antenna terminals. The aim behind this is to emulate the performance gains that can be achieved in point-to-point communications when employing MIMO systems. Two well-known factors that describe the performance of the system are the diversity order and coding gain of the transmit diversity scheme. To define these terms, the SER can be written in the following form: SNR (40) The constant which multiplies the SNR denotes the coding gain of the scheme, and the exponent denotes the diversity order of the system. In the cooperative diversity schemes considered in this paper, the relays simply repeat the decoded information, and, thus, we do not really have the notion of coding; although it can still be seen as a repetition coding scheme. Hence, we will donate the constant that multiplies the SNR by the cooperation gain. From (36) in Theorem 2, the following observations can be deduced from the previous relation. It is clear that the diversity order of the system is given by, which indicates that the cooperative diversity schemes described in Section II achieves full diversity order in the number of cooperating terminals, the source and the relays. 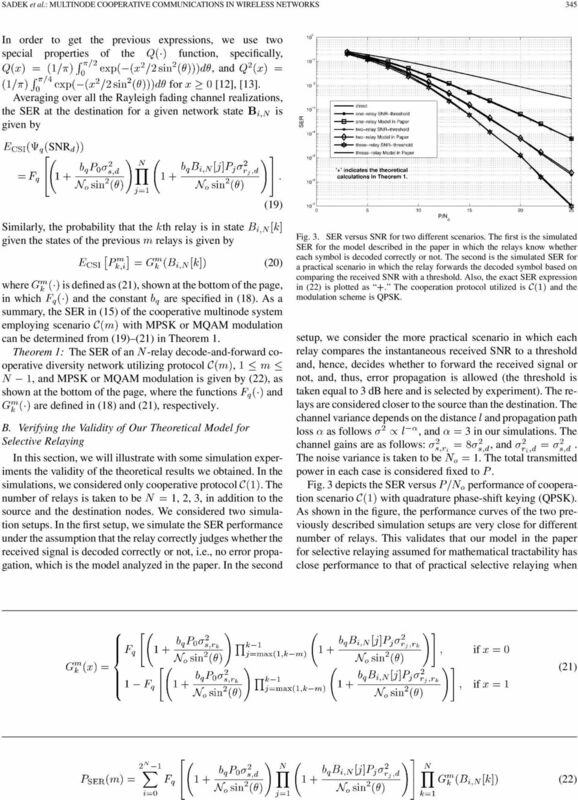 The cooperation gain of the system is given by (41) In order to validate the accuracy of the derived approximate SER we conducted some simulation experiments. Throughout all the simulations, and without loss of generality, the channel gains are assumed to be unity and the noise variance is taken to be. Fig. 4 considers scenario and depicts the SER performance versus for QPSK signalling. The transmitting power is fixed for different number of cooperating relays in the network. 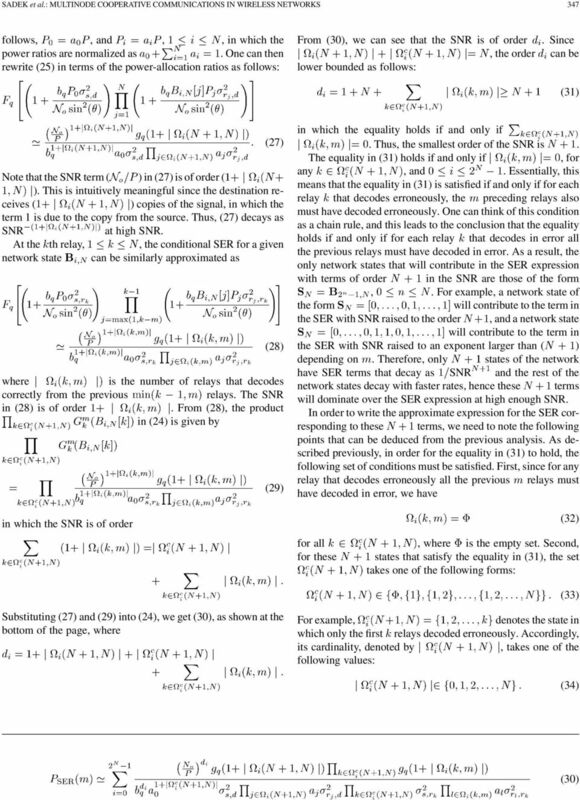 The results reveal that the derived approximations for the SER are tight at high enough SNR. Regarding scenario, we considered the 3 relays case. Fig. 5 depicts the SER performance for QPSK and 16 QAM modulation. The results for scenario under the same simulation setup are included for comparison. It can be seen from the results that there is a very small gap between the SER performance of scenarios and, and that they almost merge together at high enough SNR. 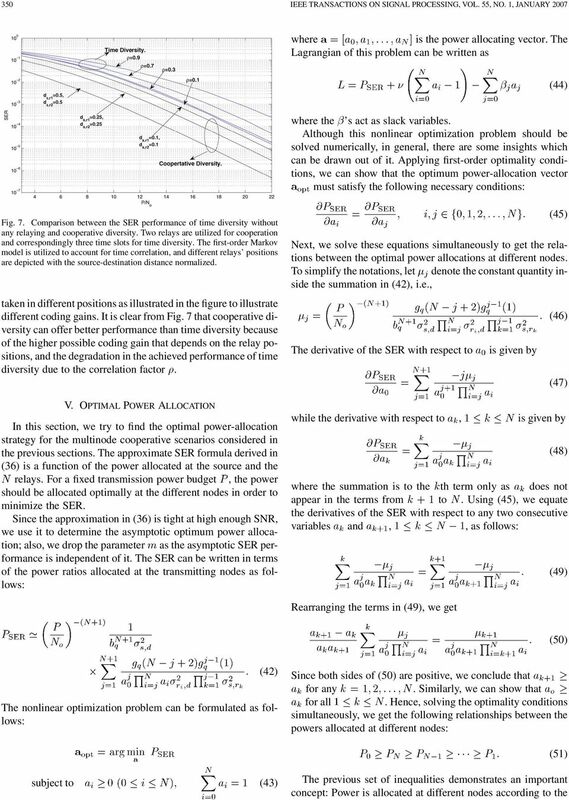 This confirms our observations that utilizing scenario can deliver the required SER performance for a fairly wide range of SNR, hence, saving a lot in terms of channel estimation, thus computational complexity, requirements to implement the protocol. 15 SADEK et al. 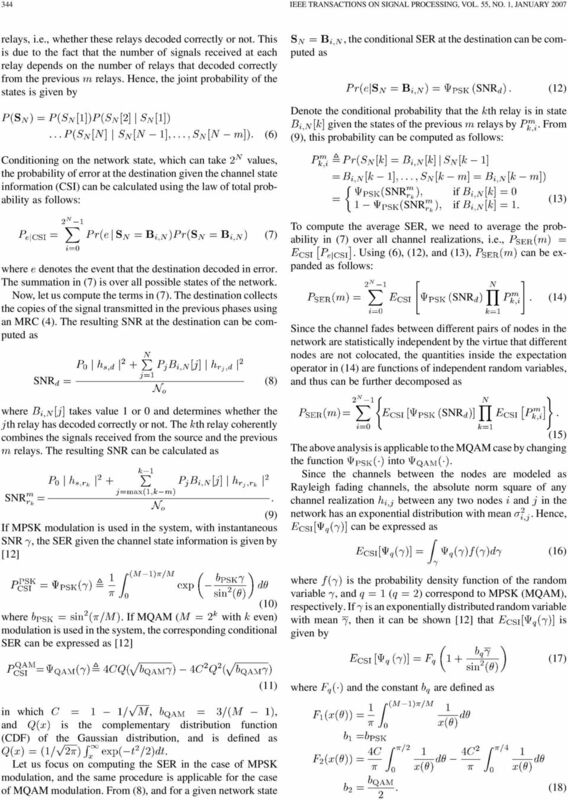 : MULTINODE COOPERATIVE COMMUNICATIONS IN WIRELESS NETWORKS 355  J. W. Craig, A new, simple and exact result for calculating the probability of error for two-dimensional signal constellations, in Proc. 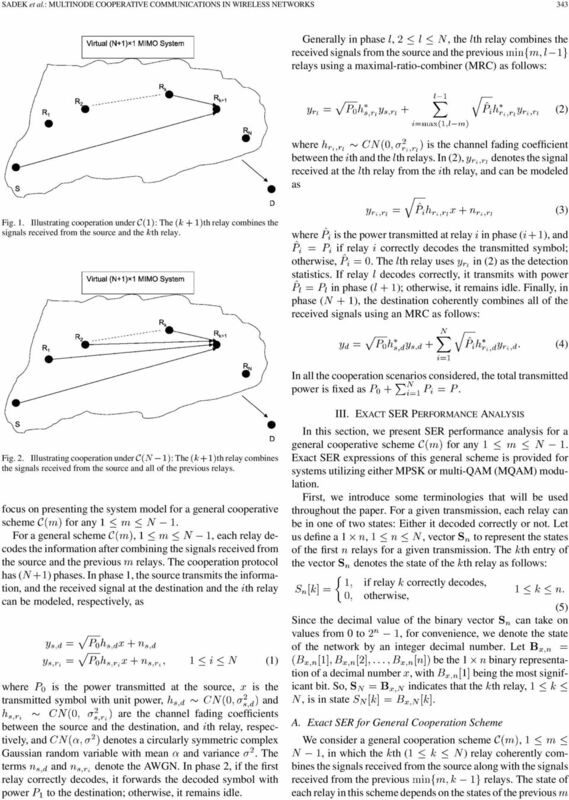 IEEE Milcom., Boston, MA, 1991, pp  G. Kramer, M. Gastpar, and P. Gupta, Cooperative strategies and capacity theorems for relay networks, IEEE Trans. Inf. Theory, vol. 51, no. 9, pp , Sep  G. Scutari and S. Barbarossa, Distributed space-time coding for regenerative relay networks, IEEE Trans. Wireless Commun., vol. 4, no. 5, pp , Sep  S. Barbarossa, Multiantenna Wireless Communication Systems. 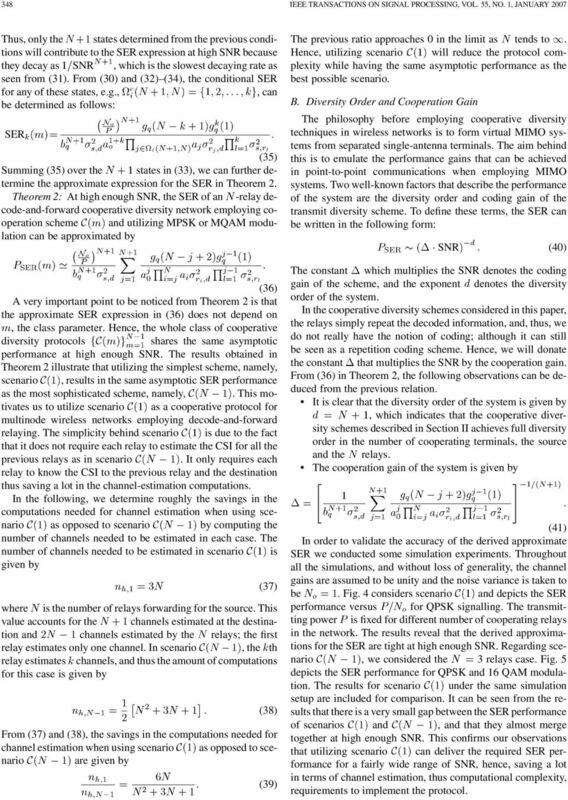 Norwood, MA: Artech House,  L. Zheng and D. N. C. Tse, Diversity and multiplexing: A fundamental tradeoff in multiple-antenna channels, IEEE Trans. Inf. Theory, vol. 49, no. 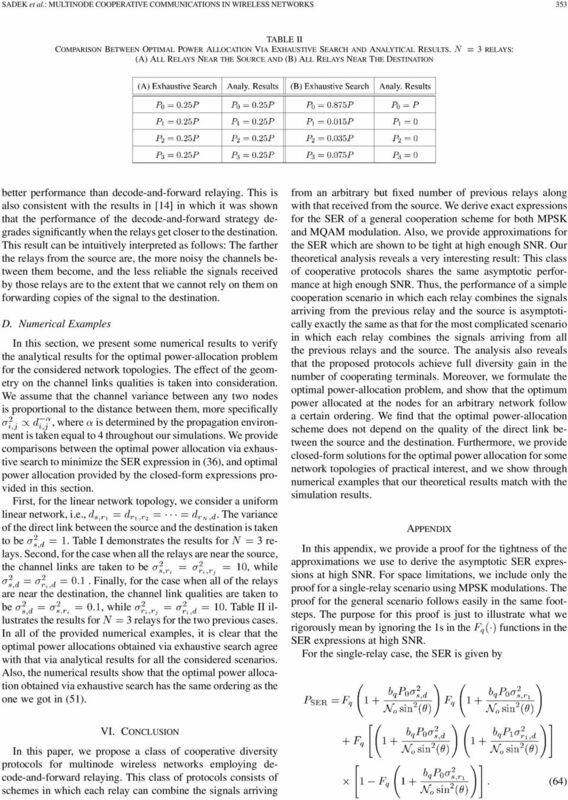 5, pp , May  H. S. Wang and P.-C. Chang, On verifying the first-order Markovian assumption for a Rayleigh fading channel model, IEEE Trans. Veh. Technol., vol. 45, no. 2, pp , Mar Weifeng Su (M 03) received the B.S. and Ph.D. degrees in mathematics from Nankai University, Tianjin, China, in 1994 and 1999, respectively, and the Ph.D. degree in electrical engineering from the University of Delaware, Newark, in He is an Assistant Professor at the Department of Electrical Engineering, State University of New York (SUNY), Buffalo. From June 2002 to March 2005, he was a Postdoctoral Research Associate with the Department of Electrical and Computer Engineering and the Institute for Systems Research (ISR), University of Maryland, College Park. His research interests span a broad range of areas from signal processing to wireless communications and networking, including space-time coding and modulation for MIMO wireless communications, MIMO-OFDM systems, cooperative communications for wireless networks, and ultrawideband (UWB) communications. Dr. Su received the Signal Processing and Communications Faculty Award from the University of Delaware in 2002 as an outstanding graduate student in the field of signal processing and communications. In 2005, he received the Invention of the Year Award from the University of Maryland. 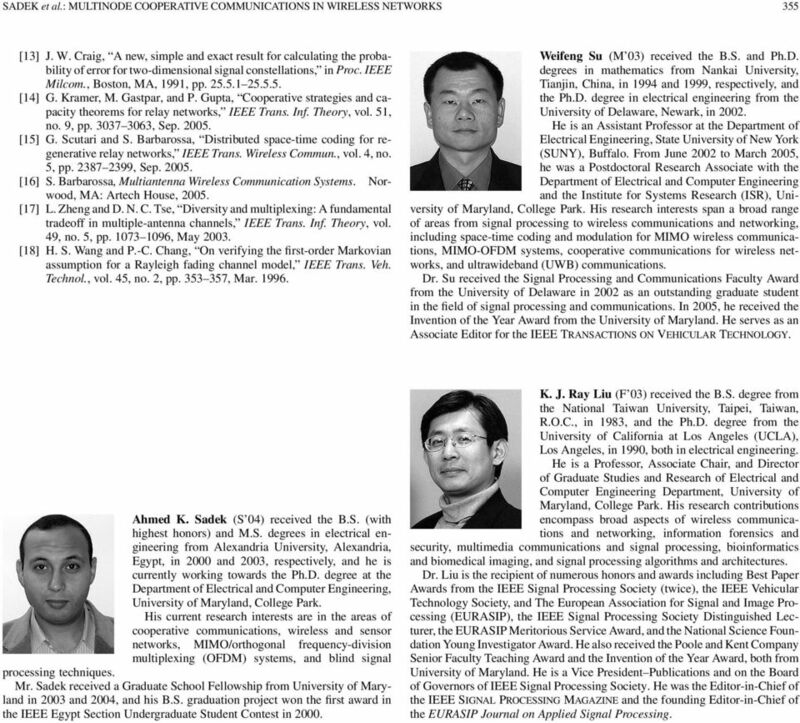 He serves as an Associate Editor for the IEEE TRANSACTIONS ON VEHICULAR TECHNOLOGY. Ahmed K. Sadek (S 04) received the B.S. (with highest honors) and M.S. degrees in electrical engineering from Alexandria University, Alexandria, Egypt, in 2000 and 2003, respectively, and he is currently working towards the Ph.D. degree at the Department of Electrical and Computer Engineering, University of Maryland, College Park. His current research interests are in the areas of cooperative communications, wireless and sensor networks, MIMO/orthogonal frequency-division multiplexing (OFDM) systems, and blind signal processing techniques. Mr. Sadek received a Graduate School Fellowship from University of Maryland in 2003 and 2004, and his B.S. graduation project won the first award in the IEEE Egypt Section Undergraduate Student Contest in K. J. Ray Liu (F 03) received the B.S. degree from the National Taiwan University, Taipei, Taiwan, R.O.C., in 1983, and the Ph.D. degree from the University of California at Los Angeles (UCLA), Los Angeles, in 1990, both in electrical engineering. He is a Professor, Associate Chair, and Director of Graduate Studies and Research of Electrical and Computer Engineering Department, University of Maryland, College Park. His research contributions encompass broad aspects of wireless communications and networking, information forensics and security, multimedia communications and signal processing, bioinformatics and biomedical imaging, and signal processing algorithms and architectures. Dr. Liu is the recipient of numerous honors and awards including Best Paper Awards from the IEEE Signal Processing Society (twice), the IEEE Vehicular Technology Society, and The European Association for Signal and Image Processing (EURASIP), the IEEE Signal Processing Society Distinguished Lecturer, the EURASIP Meritorious Service Award, and the National Science Foundation Young Investigator Award. He also received the Poole and Kent Company Senior Faculty Teaching Award and the Invention of the Year Award, both from University of Maryland. He is a Vice President Publications and on the Board of Governors of IEEE Signal Processing Society. He was the Editor-in-Chief of the IEEE SIGNAL PROCESSING MAGAZINE and the founding Editor-in-Chief of the EURASIP Journal on Applied Signal Processing.